RAPAPORT... Continued violence in the Central African Republic (CAR) is making it impossible for the nation to develop its diamond sector, according to the World Diamond Council (WDC). A massacre in Bria left 30 people dead last week — the latest in a string of fatal incidents in the eastern region, which is currently prohibited from exporting rough under the Kimberley Process (KP). While increasing the number of “green zones” — areas the KP has deemed compliant with its regulations — is essential for the sector to generate more revenue, that can only happen if those areas of the country cooperate with the KP, said Stephane Fischler, president of the WDC, which represents the industry at the KP. Two groups are fighting for control of locations where they can levy taxes, including mining sites, UN sources told Rapaport News Tuesday. Though the incidents are violent, the recent fighting is not unusual by the country’s standards, the source added. “The violence…is unfortunately systemic and is located in the eastern part of the country, where all the diamond zones are banned for exports by the KP,” said Fischler. In 2013, the KP suspended CAR, banning it from exporting rough diamonds after rebels took over the nation’s government. After carefully monitored changes were put in place, portions of CAR were readmitted to the KP in 2016. Only the green zone regions in the west — including Berberati, Boda, Nola, Carnot and Gadzi — may export rough. Some non-governmental organizations, including Global Witness and Human Rights Watch, have opposed CAR’s readmittance, claiming groups are still smuggling diamonds out of the country and bypassing human-rights concerns. “The difficulty is that the CAR government has a very weak capacity to pacify its whole territory,” Fischler said. However, he noted, the trouble in the east is not a cause for concern for those areas currently adhering to KP rules, as the governing body has a strict monitoring system in place to ensure traceability of all rough diamonds mined in the green zones. 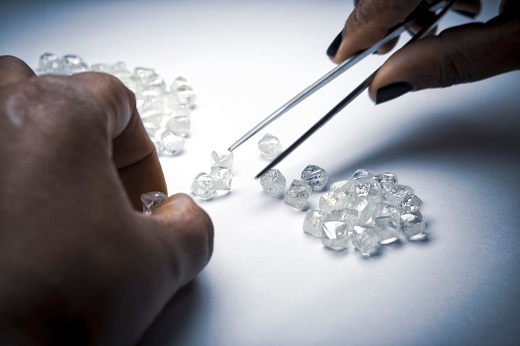 “While [the violence] is a huge concern…for the CAR government, Bria is very far away from the green zones,” said Peter Meeus, an adviser to the CAR government on the diamond industry. “It’s a huge country. Current KP protocols are very stringent as to make sure [conflict] diamonds cannot be mixed into diamonds from green zones,” added Meeus, who formerly headed the Antwerp World Diamond Centre and the Dubai Diamond Exchange. CAR’s status in the KP would only come under concern if the violence occurred in approved areas, said Fischler.